But despite the challenges inherent in measuring something as intangible as KM, APQC strongly recommends that you do so. Here are a few of the reasons why my colleagues and I advocate so passionately for KM measurement. By keeping you honest about the goals you’re trying to accomplish, measurement reminds you of what’s most important and prevents you from straying too far from the big-picture vision laid out in your KM business case. Measures paint a picture of progress during the early stages of a KM implementation, before tangible results can be discerned. Data helps you recognize problems and course-correct when a KM tool or approach is not working as planned. If you are able to show evidence of KM’s effect on the business, your KM program will be better protected during future organizational changes or cost-cutting efforts. If you need more reasons to track KM performance, analysis of data from APQC’s Open Standards Benchmarking® database further validates the importance of measurement. This is especially true of measures designed to justify KM investment. APQC’s knowledge management metric of the month shows great diversity in the methods used to evaluate KM programs. The highest proportion of organizations use feedback from leaders and users, combined with success stories and other anecdotal evidence, to show that KM is making a difference for the business. A majority also use activity and satisfaction metrics to gauge whether KM is reaching its target audience(s) and achieving its intended purpose. Business impact and ROI measures are less common, with 36 percent and 24 percent using these methods respectively. While impact and business value measures are less widespread than other forms of evaluation, KM programs that use these methods tend to get higher marks from decision makers and more robust financial support. 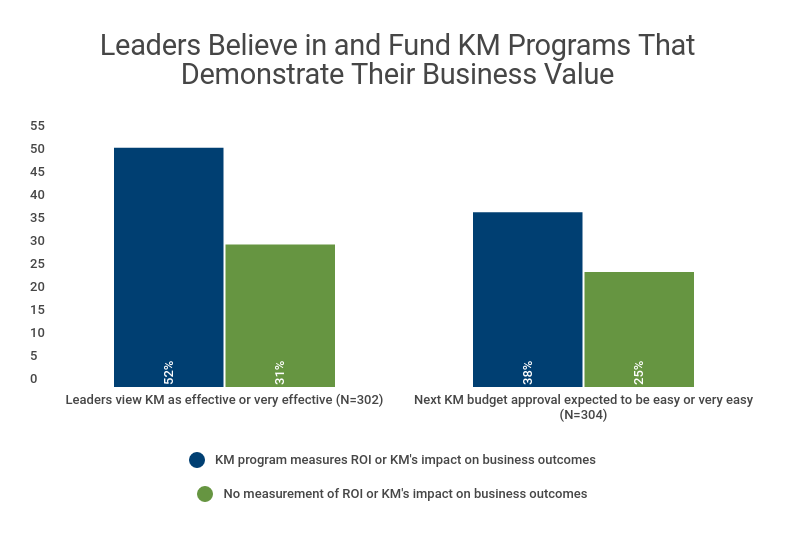 For example, KM programs that track either ROI or KM’s impact on business outcomes are 68 percent more likely to be viewed as effective by leaders and 52 percent more likely to anticipate an easy next KM budget approval. Not surprisingly, KM teams that tie knowledge sharing and reuse directly to the bottom line have the easiest time getting the funds necessary to continue and expand their programs. 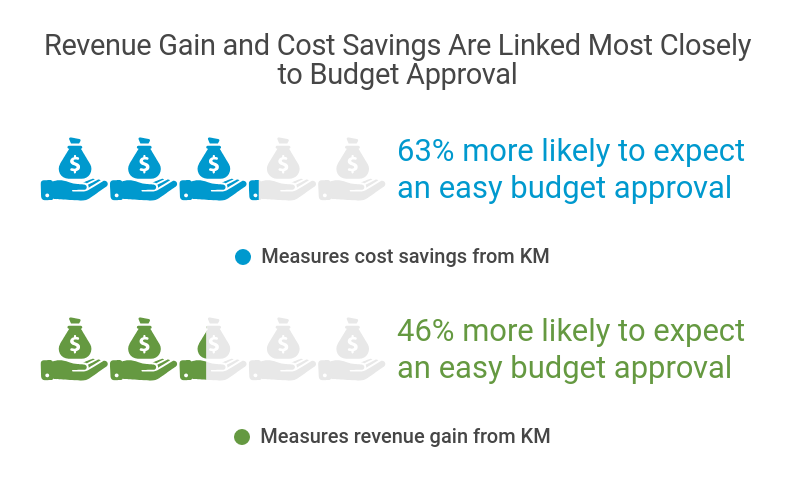 Among KM programs that track business value measures, those that gauge cost savings from KM are 63 percent more likely to expect their next budget approval to be easy or very easy. Similarly, KM programs that link KM activities to increased revenue are 46 percent more likely to anticipate an easy budget approval. 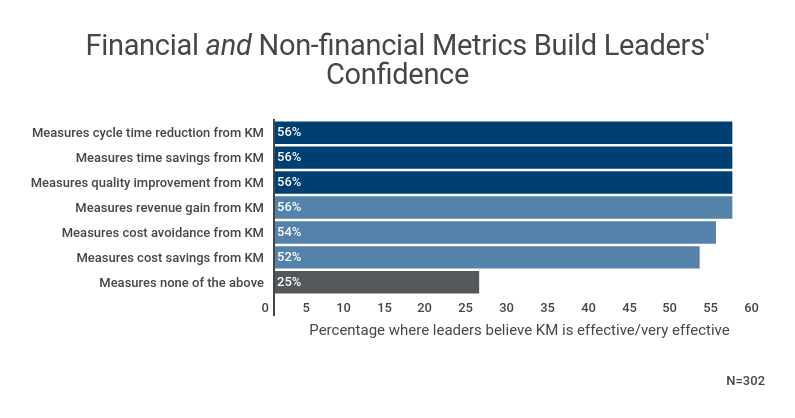 However, non-financial business impact measures such as cycle time reductions, time savings, and quality improvements appear to be equally valuable in building leaders’ confidence in KM and convincing them that it is fulfilling its intended purpose. 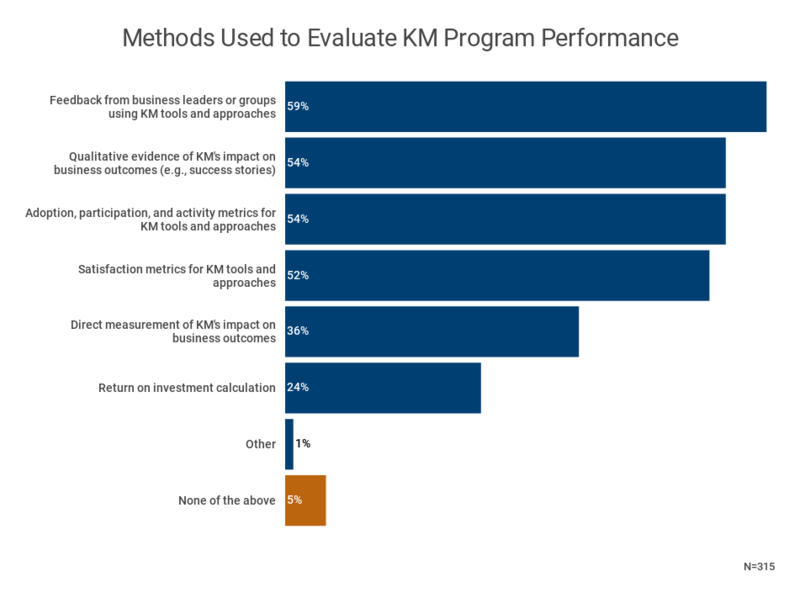 KM programs that track any business value measures are more than twice as likely to be rated as effective by leaders when compared to KM programs that assess none. The case for KM value measurement is compelling, and we urge knowledge managers not to neglect this aspect of their programs, even if sponsors and leaders have not demanded the data. Activity measures and success stories may be enough to demonstrate the promise of early efforts and secure funding for the expansion of small-scale implementations. But as your KM program grows and matures, someone will eventually ask for hard evidence that KM is worthy of further investment. 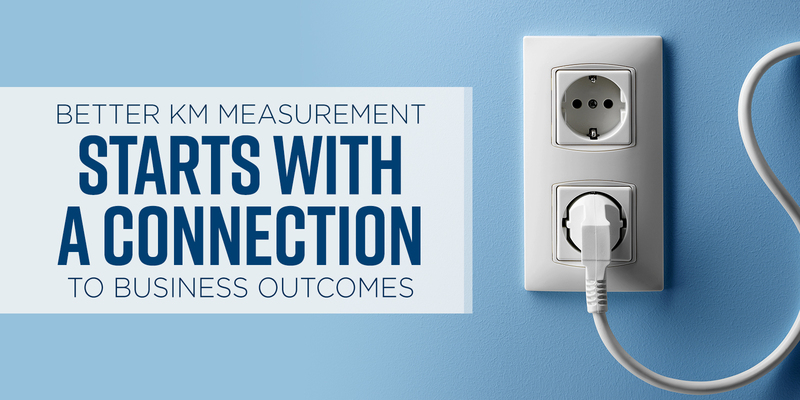 And don’t delay: Starting your measurement program early will make it easier to assess KM’s business impact down the road. For one thing, developing key performance indicators as part of your initial business case will ensure that your measures are meaningful to leaders and align with KM’s strategic objectives. Initial measurement also provides accurate baselines for KPIs, which will help you compare costs, cycle times, quality levels, and other outcomes before and after KM implementation. And the longer you track your metrics, the more longitudinal data you have, which bolsters the credibility of any trends you detect. Even if your current crop of leaders believes in the mission of KM and does not require statistical “proof” that it is working, remember that the only constant is change itself. Organizations merge, are acquired, reorganize, shift strategies, cut costs, and assign new executive teams all the time. Value measures may seem like optional “nice to haves” today, but you will be much better equipped to sell your KM program to new (or newly frugal) leaders if you can support your argument with solid metrics.